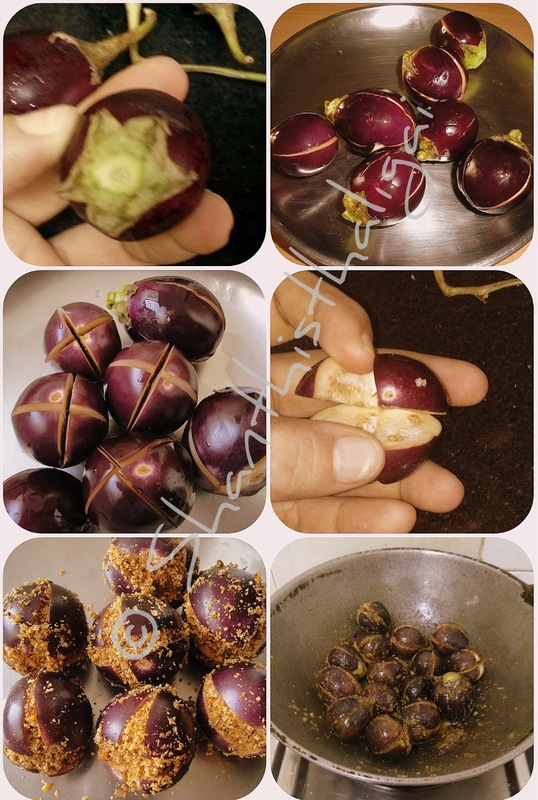 Select round variety brinjals, cut only the stem. Do not cut the sepals (pavadai in tamil, see pic.). Cut as shown in the picture like a "+" or "x" on the smooth end of the brinjal leaving the bottom portion intact with the sepals. Put in water to prevent discolouring. Meantime, mix All Purpose Karaiyamudhu Powder and little salt. Take all the brinjals out from water. Stuff with the powder. Check for worms while stuffing. Heat oil, temper with mustard seeds, add turmeric powder, hing and stuffed brinjals. Add little more salt for the brinjals, mix well, but gently without breaking the brinjals. Cook it covered in a medium-low flame for a few minutes until done. Stir in between so that all sides of the brinjal is roasted/fried well. Tasty ennai kathirikkai kariamudhu is ready. Serve hot as a side dish for south indian thali. Goes well with phulka as a dry curry. VARIATION: Karamudhu podi version1 can also be used for stuffing.